We’ve all heard about how Peckham is the new Dalston/Stokey/Walthamstow with interesting places popping up left, right and centre. 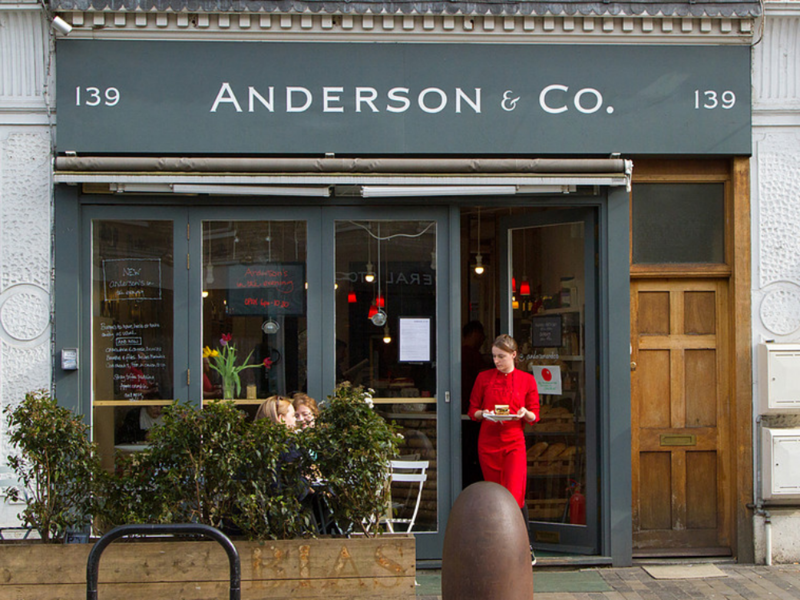 When the offer to check out Anderson and Co. arrived in the office I stuck my hand up first as it’s just 15 minutes from home for me and I’m always looking for somewhere new to add to the brunch rosta. Somehow I’d never been to Bellenden Road which is populated with a deli, butchers, yoga studio, beauty therapist, a decent looking pub and a handful of restaurants, one of which was my destination. 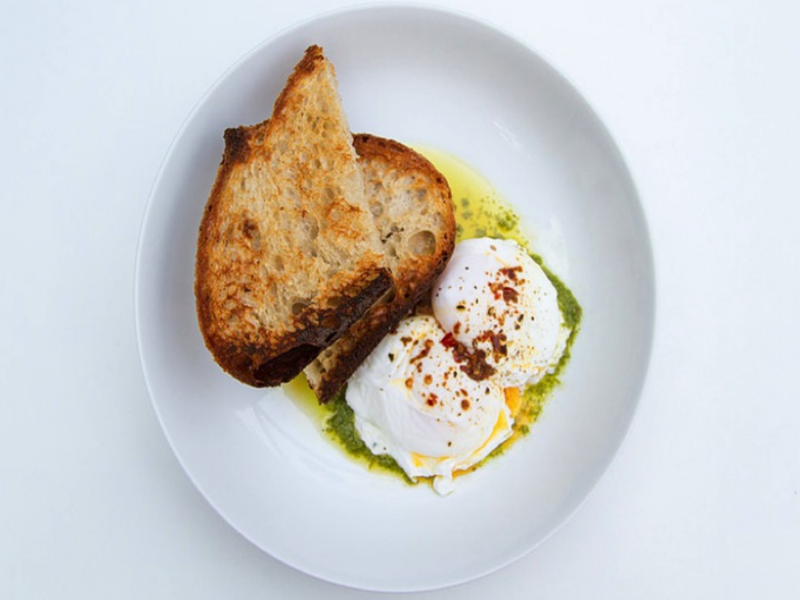 The restaurant has already established itself as a bit of a local hero when it comes to brunches so I was intrigued to find out what everyone was so excited about. The decor has a contemporary, organic, healthy feel, with some products on display to buy and take home – teas, cakes, treats for the weekend. 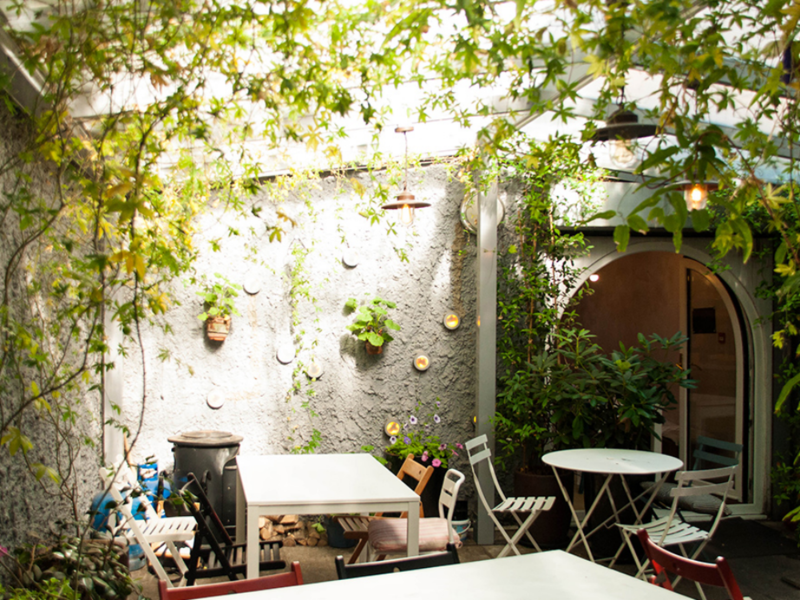 You can choose to sit in this area or walk through to the back and either sit next to the kitchen and see your eggs scrambled or at the very back in the indoor (but feels outdoor) courtyard. There’s a separate breakfast and lunch menu so there’s something for everyone. You can choose from classics such as porridge, scrambled, poached or griddled eggs on toast or more lunch-like options like kedgeree or a Peckham Burger (veggie option available too). 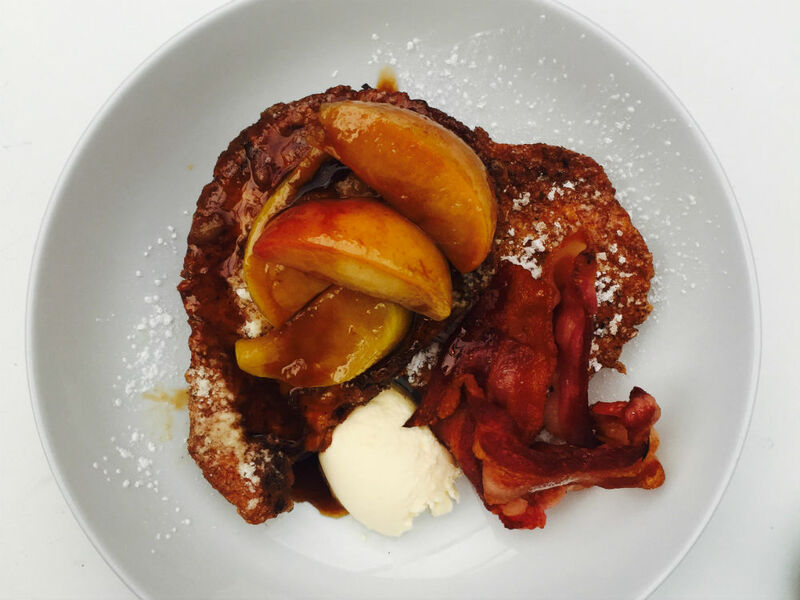 After a pot of earl grey we went for French Toast after seeing it delivered to the table next to us – served with caramelised Cox’s apples, crème fraiche and 2 rashes of bacon, dusted with icing sugar. It was every bit as heartwarming as it sounds, the interesting sounding Cilbir – two poached eggs with chimichurri (we had to ask too – it’s an Argentinian sauce that goes well with eggs or grilled meats, finely chopped parsley/thyme, scallions, minced garlic, lemon juice, olive oil, vinegar), labneh (Greek yoghurt), chilli butter and sourdough toast – it was amazing and was quickly recreated at home the next day. Lastly and so not needed between the two of us, hot date for any brunch at the moment – Avocado Toast – sourdough toast, avocado, chorizo and poached egg. Everything was beautifully presented, quick to arrive and as locally sourced as they possibly can. Aside from the wonderful food you need to say hello to the Andersons – Lisa (mother) and Hannah (daughter). They’re both very passionate about their venture and happy to answer any questions about where any ingredients originated from. After fine tuning their breakfast and lunch menus they have recently started to open in the evening with new chefs Arendt Chiverton and Teemu Tovainen previously of Quaglino’s and The Soho Hotel taking over the kitchen. It looks oh so good and I’m 100% going back in a couple of weeks – watch this space for an update on supper in E15.